Your Successful Retirement Lifestyle Plan Starts Here! Let Us Show You How to Plan for Retirement. Life's Next Steps is here to help you take control of the life changes you're going through and help you to create an extraordinary life filled with meaning, purpose and satisfaction. Dive in and find out how a Life's Next Steps retirement lifestyle planning will help you plan for retirement and how to create a retirement lifestyle you'll love living. find the road to your dream retirement lifestyle today! Work defines many of us, but that's changing for you now. 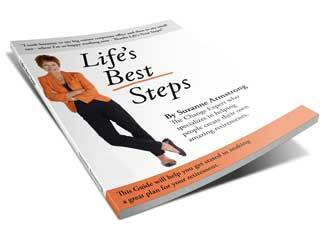 Life's Next Steps helps you gain a deep understanding of your strengths, values, interests and passions. An understanding that will be the foundation of your lifestyle over the years ahead. When you know how to plan for retirement, you're going to go through a very big transition. Many of your old networks, routines and responsibilities need to be replaced. Life's Next Steps helps you plan for retirement, and set new goals and priorities so you can make a smooth transition from what you did to the meaningful and engaging things you are going to start doing now. You can't tell if your financial plan will support your lifestyle for the rest of your life until you've done your retirement lifestyle plan. Will you continue to work? Where will you live in the near and longer term? What activities will you pursue? All these decisions and more have a huge impact on your income and expenses, and the viability of your financial plan. Life's Next Steps helps you make important lifestyle decisions that enable you to plan your finances with confidence. Most of us are very used to working to a plan. Business plans give us direction, focus and benchmarks to measure our success by. A lifestyle plan will do the same. And you'll get help putting your plan into action. When you have your retirement lifestyle plan in hand and know what you're going to do, and how and when you're going to do it, you're truly living. Copyright © 2019 Life‘s Next Steps. All rights reserved.